First- and second-place finalists from each campus compete in the Webster's Got Talent finals. The Geneva campus was the center of Webster's Europe-based talent this in both performing arts and athletics as it hosted the annual soccer tournament and Webster's Got Talent competition. Students from Webster's Leiden, Geneva and Vienna campuses gathered April 16 for a day-evening series of fun competition. After the soccer (football) tourney, an all-star Webster team played against a team of young refugees and asylum seekers from Iraq, Iran and Afghanistan who regularly interact with the Webster Humanitarian Association. 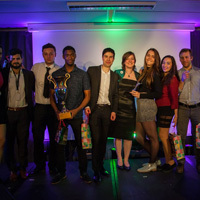 During the day, teams from all three campuses competed in the European Soccer Tournament and in the evening, the first- and second-place winners from this year's Webster’s Got Talent contests held at the Geneva, Leiden, and Vienna campuses competed for the first prize in Webster’s Got Talent Europe. These events are traditionally organized on a rotating basis between the three European campuses and this year Webster Geneva hosted a talented and enthusiastic group to the delight of all. After Leiden's team won the tournament, an all-star Webster team played a friendly against a team of young refugees and asylum seekers. The soccer tournament, held at the indoor gym of the Nations campus of the International School of Geneva, had five competing Webster teams (two from Geneva, one from Leiden, two from Vienna) playing for the coveted European trophy. After qualifying games, semi-finals and finals the winners were decided upon - Leiden won against Geneva 1:0 to claim the first prize. The all-star team played the team of refugees, who regularly visit the Geneva campus through the Webster Humanitarian Association-Bellevue Refugee Collaboration. At the Webster’s Got Talent Europe 2016 show, organized by the Geneva Student Government Association, students from Vienna, Leiden and Geneva showcased their varied talents, with performances of vocal and instrumental music, stand-up comedy and slam poetry. The well-attended two-hour show included a performance by Azania Noah, a Webster alumna and former contestant in The Voice Switzerland, as well as a magician who thrilled the audience with his amazing card tricks. The three guest judges, all performing arts professionals, made a decision to award Kuhle Damba, Computer Science student at the Geneva campus, with the top prize for his stand-up comedy routine.